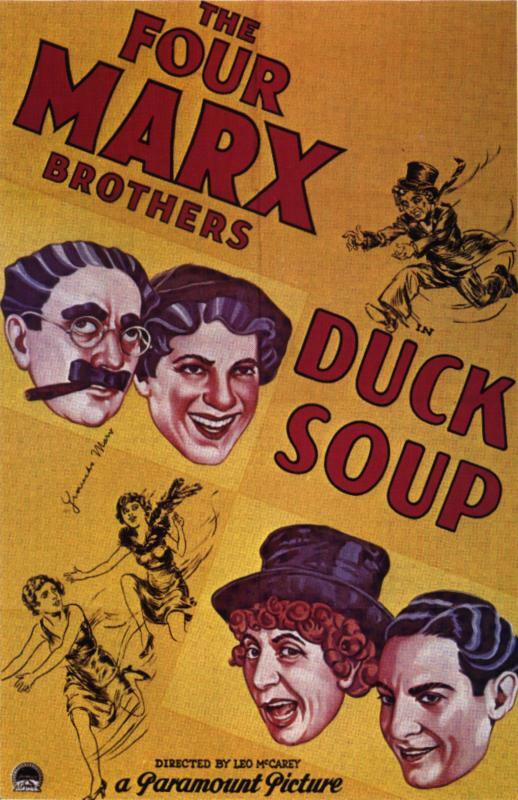 On 9.11. we went to watch this movie called Duck Soup and it was made in 1933 by Leo McCarey (USA). Before I start telling any of the plot or actors, I have to state out the jokes in this movie were so funny. This movie starred Groucho Marx as Rufus T. Firefly, Harpo Marx as Pinky, Chico Marx as Chicolini and Zeppo Marx as Lt. Bob Roland. In the beginning of the movie Mrs. Teasdale insists that Rufus T. Firefly would be appointed leader of the small and bankrupt country Freedonia, otherwise she would not give any financial assistance to the country. Meanwhile the neighbouring country sylvania is attempting to take over Freedonia. Chicolini and Pinky are sent to Freedonia. Chicolini gets appointed as secretary of war after Firefly finds him selling peanuts on the street. The two neighbouring countries are moments away from war. Soon enough the lead of Sylvania find out that the war plans are in posession of Mrs. Teasdale and so they send Chicolini and Pinky to steal them. Chicolini and Pinky get dressed up as firefly but get caught for this and they go under trial, and during this time war is declared between these two countries. The leader of Sylvania is caught. The movie ends in Mrs. Teasdale screaming the Freedonia National anthem which results in people throwing fruit on her. I thought that the best actors were Groucho Marx and Harpo Marx because of their funny posture, facial emotions, comments and attitude to everything. The ironic thing about them both being funny, famous and good actors is that they are brothers. I think this movie was hilarious especially in the beginning but then the movie got a little bit too boring. I dont think I would watch this in my own time, the genre of this movie was comedy and I think that it wouldve been better if you wouldve took off the boring parts. Also the end was hilarious. I think that the age group for this movie should be over 15 and no maximum limits because I dont see why the elderly could not watch this but under 15 year old probably would not get the plot and the jokes of this movie. From 1-10 I would give this movie a 6.